Adamson's Peak Performance is Redding's most unique fitness center. With a staff completely made of physical trainers, our clients get real results from our fitness workouts and fitness programs. We have two floors of exercise equipment and fitness equipment. We feature the best gym training around with circuit lifting, free weights, martial arts and kickboxing. 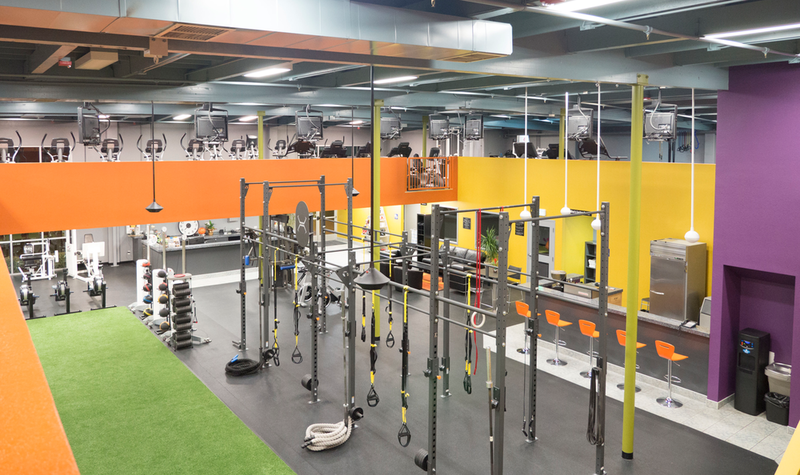 Get ready for the ultimate gym experience in our new state-of-the-art facility. Enjoy access to our strength training and cardio equipment, executive locker rooms, and saunas with our Access Membership. We have several membership options at Adamsons. Choose the option which best fits your budget, the type of training you prefer, and the amount of training you desire. Our memberships are tiered, meaning that each tier includes most of the benefits of the tiers below. See the diagram below. Month to month options are available upon request. Get the accountability of a trainer and energy of a group setting with our team training sessions. Only thirty minutes long, these are time-efficient strength and conditioning sessions led by one of our personal trainers. The five different training types each have a different focus and can easily be combined with each other. It’s our most popular program. Team Training Memberships include a full gym membership, all group exercise classes and a complimentary private session with a personal trainer. Make your body your machine with the versatile TRX suspension straps. With TRX, it's all core, all the time! TRX's are amazingly adaptable - everyone gets challenged, beginner to pro! High-intensity metabolic and conditioning class which integrates mixed martial arts and self-defense moves with minimal rest periods. Note: Class instructions start 5 minutes before the listed times. High-intensity interval training using ropes, medicine balls and TRX. Full-body strength training using functional, multi-joint exercises. Muscle restorative sessions incorporating low-intensity dynamic movements, stretching, foam rolling and more. Functional strength and conditioning circuits for seniors, beginners, and clients recovering from injuries. Considerably less intense than Team BURN. Personal training has been the foundation of our services at Adamson's Peak Performance for over 20 years! We believe that personal training is the ultimate way to train because of the education, accountability, and motivation it provides! All of our personal training memberships include unlimited Team Training, as well as an Access Membership. With one-on-one training you receive 100% of the trainer's attention. After assessing your limitations, goals, and beginning fitness level, we design a personal exercise prescription which becomes progressively more challenging as your health and fitness improves. We have a personal training-only area upstairs which we utilize for clients who want a more private setting. In addition to our 6-month memberships, one-on-one can be purchased by the session or in bundles of 10, 20, or 30 sessions. One-on-One Membership starts at $189/month! Add a friend or spouse to One-on-One Training and you have Buddy Training! Adding a training partner can bring an extra degree of motivation, accountability, and fun, as well as reduce the per person cost by about 30%. Buddy Training Memberships start at just $249/month! 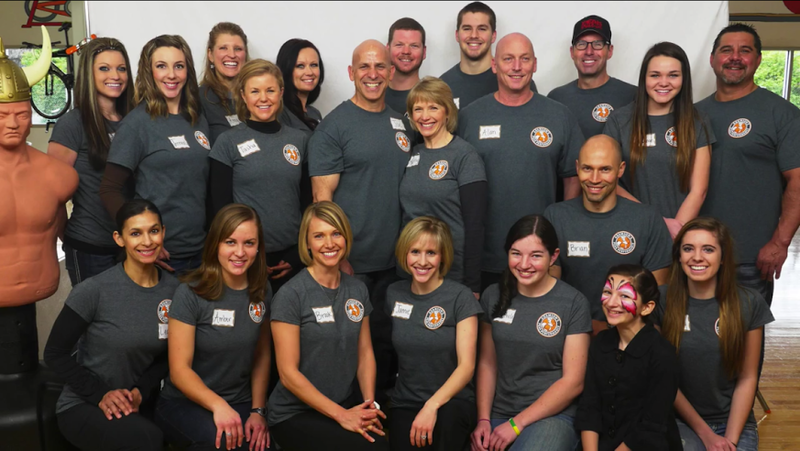 Train with a small group of family members, friends, or co-workers and share the cost of a personal trainer. Please call for prices and details. Babysitting can be added to any membership for $15/mo for the first child and $5/mo for each additional child. Pay per visit rates are also available.